Never before in my life has four months seemed to fly by so quickly. Our sabbatical was wonderful. Except for the threat of Mary’s impending surgery and the considerable time spent in trying to arrange for home care when that happens, it was an almost totally positive experience. I was able to relax in the sun on beautiful quiet Homer Hill, read more widely than I have for years, and together with Mary enjoy numerous day trips or overnight trips to some of our favorite spots along the Maine coast. Doing that also freed Mary up from cooking and cleaning and other routine responsibilities at home and here at the AIIA office. Perhaps most importantly we were able to pray together and think about how we would like to focus our efforts in ministry with AIIA over the next few years, as God allows. More details on that coming in future months. As regards the status of Mary’s diagnosis of aortic valve stenosis, not a great deal has changed since her echocardiogram in early July (see previous blog entry). She continues to experience almost zero concerning symptoms, e.g. lightheaded, short of breath, weakness. We are convinced that this is God’s power at work because earlier this year we were all — including the cardiologist — convinced that she would probably be due for surgery late this Summer or early Fall. But she really wanted to be feeling well for a visit from Andrew and his family in August — and that is happening now, as I write! We have no guarantee of what next month or even tomorrow may bring (who does? ), but it seems clear that for now God in His mercy has moved to grant us some additional time before the next step in this journey. The photo at top was taken with my parents (Gene & Ann Witmer), my brother Randy and his wife Glenda, my sister Gina and her husband Jack, and Mary and me on July 16 in Lititz PA when we gathered to celebrate my mother’s 90th birthday. 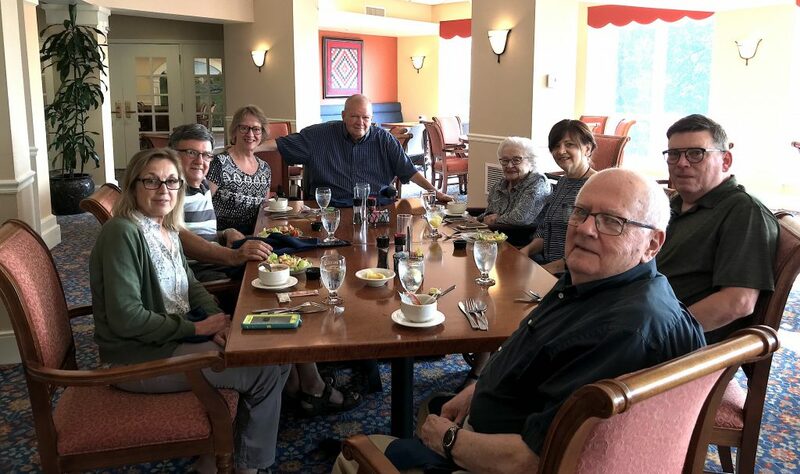 Dad is now approaching 91, so we were very blessed to have spent this time together with them all again, another benefit of God’s provision in holding off any further worsening of Mary’s condition for now, thus allowing us to travel to Pennsylvania. Thank you for your prayers, concern, and interest in reading along.